Green Card: There is no tier point minimum to maintain this status. 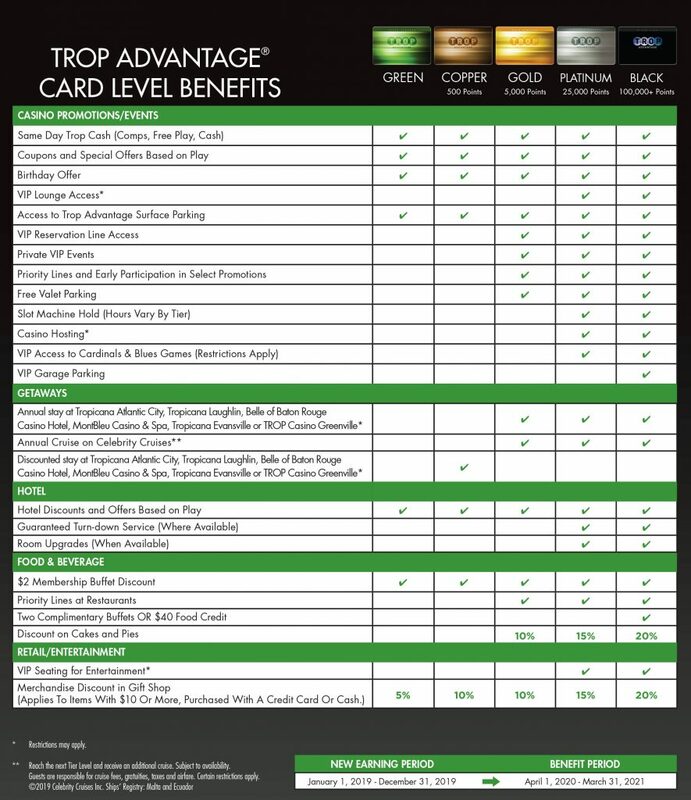 Copper Card: Earn at least 500 tier points annually. Gold Card: Earn at least 5,000 tier points annually. Platinum Card: Earn at least 25,000 tier points annually. Black Card: Earn at least 100,000 tier points annually. Tier-level benefits come with increasing rewards! Play today and earn your way to a yearly cruise and an annual trip to another Tropicana property like Atlantic City or Lake Tahoe and much more! Based on your play, you also earn Trop Cash, which can be used on your favorite slot or table games, for a delicious meal at one of our convenient restaurants, to shop at one of our casino retail outlets, for hotel stays or even cash back. HOW DO I SIGN UP FOR A TROP ADVANTAGE CARD? Visit the Trop Advantage® Center at Lumière Place. Show your valid photo ID to players club representative and get your Trop Advantage membership card. HOW DO I USE MY TROP ADVANTAGE CARD? Your Trop Advantage card is your key to many rewards, so be sure to use it when playing slots & table games. Slot Players: You must have your Trop Advantage Players Card properly inserted into a slot machine in order to earn tier points and Trop Cash. Table Players: Play will be rated at a table game by presenting your Trop Advantage Players Card to a Table Supervisor. You’ll earn tier points based on the game played, average bet and time played. WHEN DOES TROP CASH EXPIRE? Trop Cash expires after six months. WHERE DO I VIEW TROP CASH AND TIER POINTS? You can review your account information in a variety of ways. Gain instant access 24/7 via mytropaccess.com; swipe your TROP ADVANTAGE® Card at any promotional kiosk; or visit the TROP ADVANTAGE® Center and speak to one of our friendly representatives. HOW DO I REDEEM FREE PLAY? Swipe your TROP ADVANTAGE® card at any promotional kiosk to download and redeem your free play offer(s). The benefits of your card account extend to promotion mailings, direct mail and email offers and are based on your level of play. Be sure to keep your address and email address current and use your card every time you play to enjoy maximum rewards.